Before going into the evaluation of benefits, let's review the basic machining process. The input surfaces are not accurate for construction purposes. The goal in CNC milling is to be able to cut the plug automatically without any lengthy final preparation by hand. The assumption is that the input 3D computer surface shape is accurate to begin with. This depends on the program used to define and fair the hull and the skill of the program's operator. Since there is no automatic way for a hull design program to guarantee fairness, it is up to the designer to make sure that what is sent to the milling machine is accurate and smooth. Surface irregularities which are nearly invisible on a small computer screen get magnified greatly when the hull plug is milled full size. In addition, a hull model may look smooth when rendered in 3D with colors, lights, and reflections, but the underlying surface may not be accurate enough for construction purposes. Most photo-realistic rendering software gloss over and hide many surface irregularities. That may be fine for the company brochure, but it is not accurate enough for the milling machine. Conversion problems from the CAD program to the CAM program. Geometric problems due to fillets, creases, cutouts, etc. One of the main advantages of CNC milling is the promise of a fast turn-around time. Often, the success of a project may depend on how quickly you can get a product to market. Whether it is to build a prototype to bring to the show or to build a master mold for production use, CNC milling promises speed. Let's review some of the areas that can help or hinder a fast turn-around. Although the speed of the CNC milling machine is main reason for the speed of plug production, there are many other factors that can contribute. One is the experience of the CNC company providing the service. The more and varied jobs they have done, the better they will be able to solve any unusual hull geometry you may have. In certain cases, the milling time ends up being only a small portion of the time it takes to do the overall job, and the "special" problems dominate. Depending on your goal (one-off or production boat), the experienced tooling company can foresee problems and suggest optimum choices in things like the type of foam used and whether to mill a male or female plug. The promise of accuracy, fast turn-around time, and lower costs can be achieved using CNC milling machines if you have a good understanding of the process and its advantages and limitations. Some people expect too much and are disappointed with the results. You should start with an easy project and progress to more difficult projects. Don't wait until a complicated hull has to be built in a short time to learn about the CNC process. Has 5-axis CNC cutting with up to 10' X 15' platform. 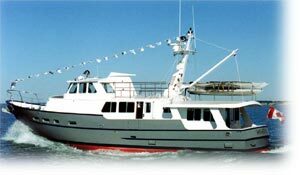 Specializes in CNC rudder and keel construction. Has large 68' X 19' X 8' 5-axis CNC machine. One of the original leaders of 5-axis machining. Machines excellent half-hull and full-hull models up to 4'. Can perform the whole tooling process.